On Friday September 14th, the managers at Price’s Alarms took a pie in the face to help raise money for the Run for the Cure and breast cancer research. We have been involved in supporting the Run for the Cure for many years but it does get a little tougher every year to beat the amount raised previously. 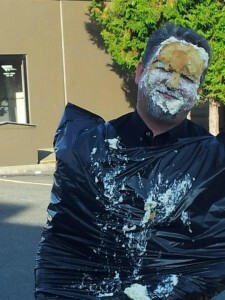 This year, our Run for the Cure team captain had an amazing thought …”I bet staff would pay good money to throw a pie in the face of a manager”. She was right, but now she had to see if the managers would be open to the idea in the name of supporting a good charity. The idea was an instant hit with staff and management alike, we even had a few people outside management that people wanted to pie. 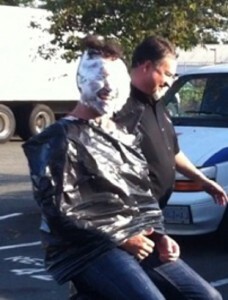 So we opened up the bidding and had 10 managers and 2 staff lined up to take a pie in the face. The person who bid the highest got to throw the pie. Our social committee ordered in some pizza for 5:00pm on Friday and we all got together out back of our Glanford Street head office to end our day on a high note. Person after person took a pie in the face until we’d laughed ourselves silly. In the end, we have now raised almost $3000.00 for the Run for the Cure and we still have another 2 weeks of fundraising left. The staff and management of Price’s Alarms are proud to be a part of the communities in which we serve. Supporting our community not only feels good but ending a day with laughter and camaraderie makes you want to do it over and over again. We had a blast and wanted to share some of the photos with you.